EE has announced a new 4G antenna service for homes than can help deliver broadband speeds of more than 100Mbps to rural communities which currently lack modern fixed line access. EE has offered home broadband using a 4G router since last year but now has an extra trick up its sleeve: a powerful external antenna. By mounting an antenna on the exterior of a property EE is able to boost a weak signal, improve reliability and provide rural customers with broadband that’s faster than many fibre optic home broadband services. 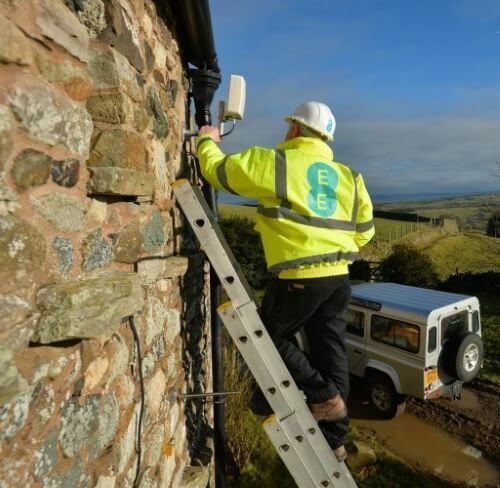 Working with Northern Fells Broadband, EE has been trialling the service in Cumbria and says that homes there are already getting download speeds in excess of 100Mbps. It’s now offering the professional antenna installation nationwide as an addon to its 4G home broadband product. Prices for EE 4G home broadband start at £25 per month for 10GB data, going up to £60 for a 200GB allowance. The antenna is available for a one-off fee of £100. While this may seem poor value compared to a cheap unlimited home broadband package using a conventional fixed line, it’s a price that many rural home and business owners may be willing to pay to get a fast broadband connection.